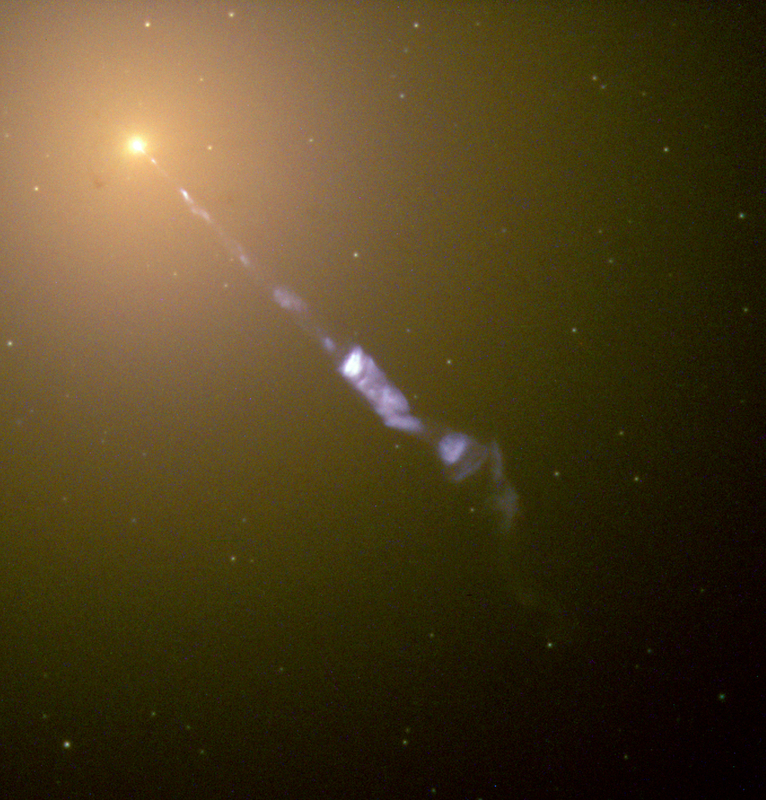 Figure 1: Hubble image of M87's jet, spanning a distance of ~5000 ly from the core. Messier 87 (M87) is a giant elliptical galaxy that is best known for its spectacular, 5000-ly-long jet (see Figure 1). The jet velocity is extremely relativistic, and it’s oriented at an angle relative to us such that we see the extended emission on the sky from the forward-pointing jet, but on large scales we don’t see the emission from the counter-jet due to relativistic effects. M87 is also, along with Sgr A* (the black hole at the center of our galaxy), one of the two largest black holes in the sky. Its huge mass gives it a large effective size that makes up for the fact that it’s 16Mpc away, resulting in an angular size that’s about 4/5 that of Sgr A*. This large angular size is important for one good reason: it gives us a target. Black holes are, technically, still theoretical objects: no one has ever made a direct observation of a black hole! It’s only by indirect evidence that we know they exist. But observational technology is slowly catching up to the theory, and our best bets for targets of future direct imaging are obviously the largest BHs on the sky. With this in mind, the authors of this paper want us to know what to look for when observational technology does catch up. Thus, they create extremely comprehensive models of M87 at radii very close to the black hole itself (a very difficult region to model!) and predict what we can expect to see with observational campaigns in the near future. In order to predict what a direct detection of a black hole would look like, the authors have to examine the region very close to the black hole, where the jet is first launched. The process of launching a jet from the accretion disk around a black hole is not well understood, and it’s only very recently that general relativistic magnetohydrodynamic (GRMHD) simulations of black holes have been able to reproduce this process. The authors make use of one such simulation by performing relativistic radiative transfer calculations on it and using the result to create models of the innermost region of the M87 nucleus. These are the first-ever radiative disk/jet models of M87 based on a GRMHD simulation of a black hole, and also the first images of any jet-launching region from a simulation. The authors report several interesting results upon examining their M87 models. 1) The images at 1.3mm (a target wavelength for submillimeter very long baseline interferometry, or sub-mm VLBI, which is our best bet for direct detection of black holes) that result from the models are crescents (see Figure 2). This is a result of the combination of several relativistic effects: gravitational lensing and Doppler beaming of the compact emission region. 3) The black hole shadow — which is direct evidence for an event horizon — is of a size that could be observable with future sub-mm VLBI, using planned baselines between Hawaii and Chile. Thus, this work provides us with a concrete prediction for what we can expect to see in the innermost region of M87 with future observations. Based on these models, we can hope that direct detection of black holes — with M87 as one of the first targets — is right on the horizon! Event horizon, that is. Figure 2: Jet images at various inclinations relative to the observer, starting at edge-on (i=90°) and ending at face-on (i=0°). Initially both the jet and counter-jet are visible, but as the inclination angle decreases, the forward jet lies in the black hole shadow and the counter-jet dominates the emission. The asymmetry is due to Doppler boosting of the helical jet and rotating disk. Fig 6 in the paper. When the Sky Isn’t the Limit: Simulations of Imaging a Black Hole from Space The First Image of a Black Hole Can We Detect Exo-Seasons? What happened to the Milky Way’s sister galaxy? Great summary of a very exciting possible observation!